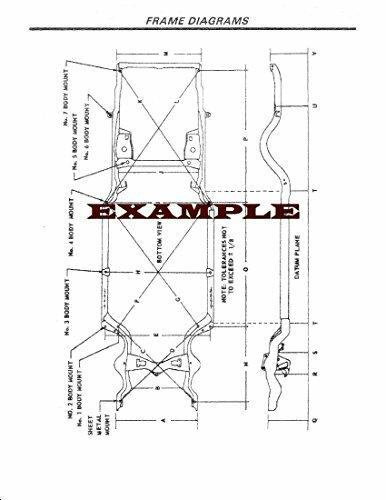 Frame diagrams to include entire frame, wheelbase & upper body frame details. Covers years and vehicles in listing title. This chart measures about 8" x 11" and is nicely laminated for ease of reading and protection from smudges and smears to preserve its readability. Here's an opportunity to pick up one of these hard to find charts for your vehicle. It gives precise bottom view body-frame dimensions and the detailed graphics you need for unsurpassed accuracy; useful for frame repair and/or determining frame straightness. A great collector and informational piece as well. Picture illustrated is just a sample of what the diagrams look like. ~ WIRING DIAGRAMS AND ILLUSTRATED PART NUMBERS, LABOR & ILLUSTRATED PRICE SHEETS ALSO AVAILABLE! ~ DISCOUNTS GIVEN ON MULTIPLE ITEM PURCHASES!